Transform your PC into a tropical coral reef. Dive right in and let these fantastically animated salt water fish enchant you. Fifteen types of salt water fish elegantly make their way through the fascinating world of the coral reefs, including Fairy Basslets coming together in a school and a lacy-looking Lionfish. All the while a shy hermit crab carefully peeks from under its shell. Diversity abounds in this screen saver - there are four vibrantly colored aquarium scenes to choose from! You can pick for yourself, or allow them to be randomly selected for you. This screen saver captivates with its realistic graphic animation, lifelike behavior of the fish, and gorgeous underwater light effects. Navigate your ship through a minefield. 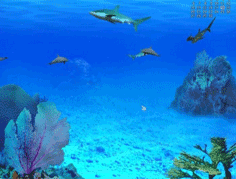 Qweas is providing links to Marine Tank 3D 2.01 as a courtesy, and makes no representations regarding Marine Tank 3D or any other applications or any information related thereto. Any questions, complaints or claims regarding this application Marine Tank 3D 2.01 must be directed to the appropriate software vendor. You may click the publisher link of Marine Tank 3D on the top of this page to get more details about the vendor.